The Lady Bulldog golf team continued its dominant run through the early season while the Bulldogs joined them at the top Tuesday in Carlsbad as the Artesia High School squads swept the Carlsbad Invitational. 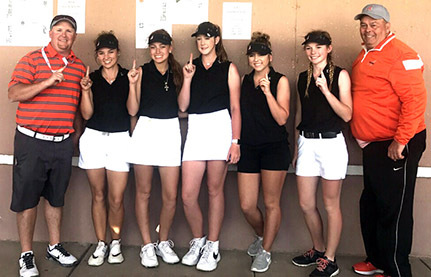 Golfing at Lake Carlsbad, the Artesia girls once again were head and shoulders above the competition, winning the two-day “Eddy County Challenge” that began Monday at the Artesia Invitational with a first-place tally of 323. That mark was 82 shots under the necessary total for a state leg – bringing the Lady ‘Dogs’ number of legs to four – and 87 shots below second-place Carlsbad (410). In addition, it was one shot under the qualifying team score for the boys’ division and 11 shots better than boys’ second-place Alamogordo. Senior Josey Jackson took first individually at the Carlsbad Invite, also locking up top honors in the Eddy County Challenge with her qualifying round of 73. Also qualifying their fourth individual legs Tuesday were Taysea Powell and Brehnan Davis, who tied for second overall with rounds of 77. Christa Bratcher secured her third individual qualifying leg with a 96, and Brile Ybarra rounded out the field with a 99. “Brehnan played the way she should be playing,” said Bean. “She’s finally getting the rust knocked off after coming out from basketball, and it takes a couple of weeks to do that. 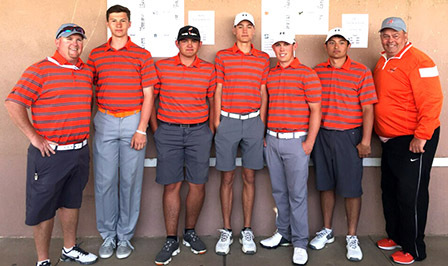 The Bulldogs logged their second of three team legs Tuesday at Lake Carlsbad with a cumulative 319, five shots under the qualifying mark and 15 shots better than second-place Alamogordo (334). Senior Parker Sanders just missed out on finishing first individually in the Eddy County Challenge, falling in a playoff with Carlsbad’s Jim Alpers, who ultimately prevailed with his first-place 73 at Lake Carlsbad. Sanders’ 74 earned him second place, as well as his second individual state leg. Senior Hector Flores also picked up his first individual leg Tuesday with a round of 79, followed by Canon Carter (80), Wesley Davis (86) and Clay Houghtaling (89). The Bulldogs and Lady Bulldogs will now prepare to head to Ruidoso Monday and Tuesday for the Leroy Gooch Invitational. The boys will compete Monday at Alto and Tuesday at The Links at Sierra Blanca, while the girls will spend Monday at The Links and Tuesday at Cree Meadows.